You must have good fishing pliers on hand if you are going to travel out on the water. A great set of pliers makes it easier for you to cut bait, line and other materials that you might have. Fishing pliers are a vital fishing gear but one that is mostly overlooked. 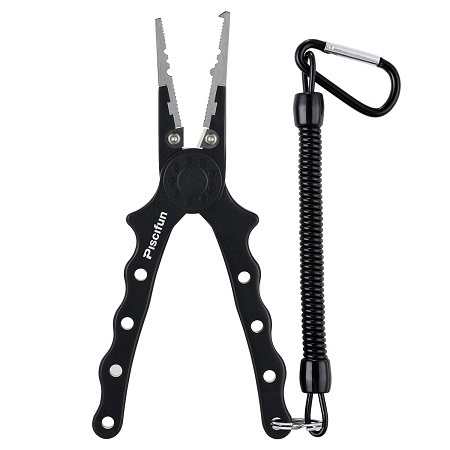 Most anglers don’t give thought to bringing fishing pliers only until they are in dire need of this necessary fishing tool. Fishing pliers are needful for removing hooks, bending wires, cutting lines, splitting rings and more. While it is true that fishing pliers are a necessary tool, it is only the best fishing pliers that make for an exciting fishing experience. Here are some of the best fishing pliers you should get your hands on. These first fishing pliers set from Piscifun is made with saltwater fishing use in mind. It uses a titanium-coated stainless steel body to add power while resisting rust. A hook remover is designed to support crank and treble hooks. The aluminum handle comes with grooves that provide you with a stronger grip. The aluminum especially keeps the pliers light in weight. You can use the nylon sheath that comes with the pliers to create a secure space where the pliers will stay closed. The 7-3/4-inch length of the pliers will be carefully secured inside your sheath while the design continues to offer a solid grip that is not too hard to hold onto. The teeth on the head especially provide a sturdy grip. The teeth are small in size and yet create a firm grip on any surface you need to work on it also cuts through thicker lines without any added problems. Another option that works in saltwater conditions, this model from Zitrades has an aluminum gripping body. It has teeth that feature a jagged point at the very end. This includes a strong hook removing the feature that makes it very easy for you to clear out hooks. At 7.1 inches in length, it is long enough to keep a strong grip on any thick saltwater line. The stainless steel jaws are very sharp and do not require much sharpening on your part. The holes on the handles keep the weight of the pliers down. They also make it so you can attach the pliers to a lanyard, belt or other space for storage and easy access. The carbide surfaces on these blades also add a durable surface that keeps the cutting process simple and easy to follow. The flat blades near the base of the points especially focus on cutting through deep lines. Designed with a sturdy aluminum body, these pliers are 7.5 inches in length and can fit on any typical user’s hand. They are long suitable for just about any kind of fishing activity. The carbon steel coating on the jaws adds a great layout while tungsten carbide works on the base to create a powerful body that adds more pressure to anything that needs to be cut. This works perfectly with the sharp points on the pliers. 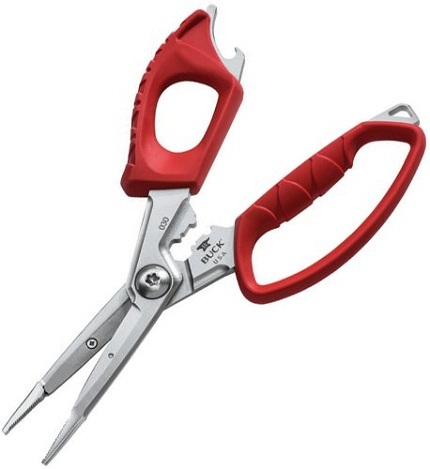 The aluminum handles reduce the overall weight of the pliers while staying strong and powerful. The grooves on the handles are light and offer enough pressure to get through any material you are aiming to cut through. The fast cutting motion and support for enough energy for clipping through various items especially adds an excellent touch that fits in with anything you intend on using your pliers for as you might see fit. 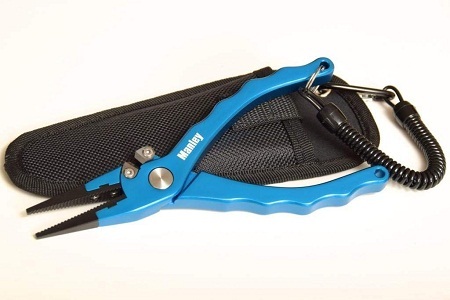 The MadBite Fishing Pliers is a durable piece of equipment that can be used as a hook remover plier, carbide braid cutter, and a split ring tool. The beauty of this pliers is not only in its usability in salt water but asp that it offers superior grip and leverage for quick clean cuts and anodized aluminum that stays bright and outlasts other tools in its category. 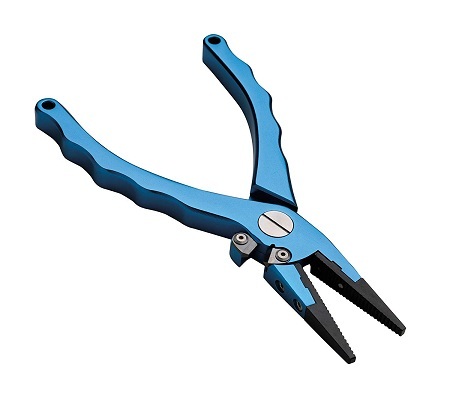 Unlike the standard rubberized grips, the silicone grips on the MadBite pliers do not slip nor retain odors, neither do they corrode. The conveniently sized an shaped plier has a belt sheath and a lanyard hole for ease of access and is ergonomic enough to fit into any hand size. 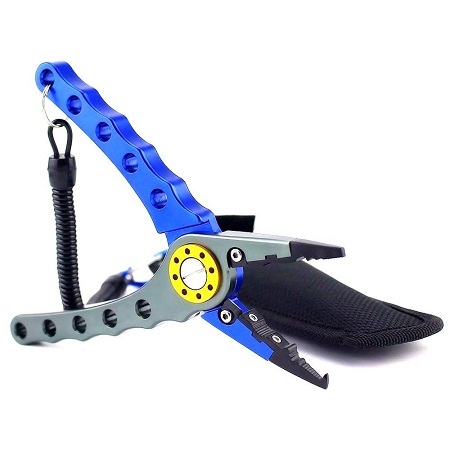 Splizzors by Buck Knives is a multi-purpose fishing tool with an innovative contemporary design which brings together different features to create a versatile tool for different fishing tasks. Buck Knives has crafted these pliers from 420HC Steel which is excellently strong and corrosion resistant. 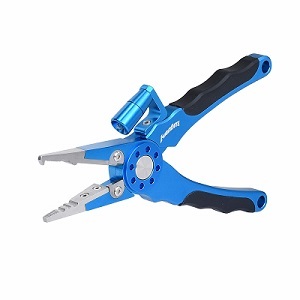 The Dynaflex handle has an integrated bottle opener, lanyard hole, and crimping tool. The tool has a polyester sheath with the multi-attachment provision which makes it easy to carry. The package comes with replaceable blades which are included in the polyester sheath. This excellent fishing gadget is comprised of tungsten carbide cutters that make cutting braided fishing lines into child’s play. The pliers are also spring loaded to remove small hooks and grip fish lines quickly. The surface of the pliers is coated to protect from exposure to salt water. 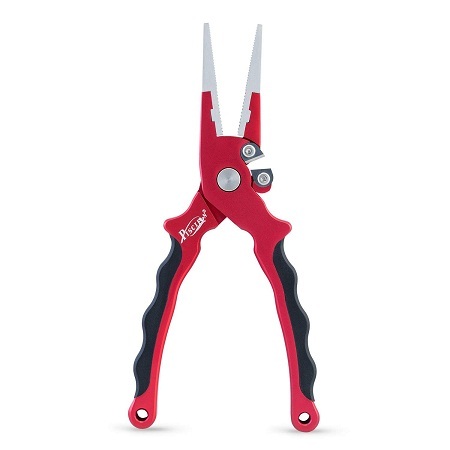 At 7.5″ the pliers are long enough to offer the much sought after perfect grip. Being one of the best fishing pliers, it would be unfair if it didn’t have a lanyard or a sheath and yes. Though it may be a bit big for the medium hand, it is hard to beat this pair for the money. Made from aircraft-grade aluminum which is further anodized to offer superior corrosion resistance, the Piscifun Aluminum Fishing Pliers is a cut above the rest. The handles are made from machine cut aluminum to deliver ergonomic grip and reduced weight for better comfort. The pliers’ jaws are made from titanium-coated stainless steel for unmatched strength and durability. The split ring design ensures that the pliers are easy to use. There is a belt loop clasp, a coiled tether and a woven nylon sheath make it easy to carry and use. 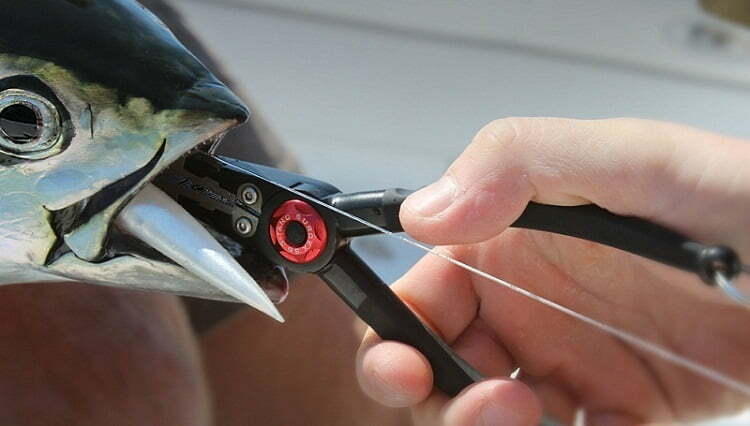 Looking for the best fishing pliers shouldn’t be anything like rocket science. It should be quite a breeze if you take into consideration the following tips on what to look out for in the best fishing pliers. Look for pliers that are made from either aluminum or stainless steel most preferably 420HC Stainless Steel. Cheap steel can turn rusty while cheap aluminum will usually bend under high pressure so always go for aircraft grade aluminum. Longer noses make deep hook removals quite easy. The Species you are after will determine the nose length of the fishing pliers you can choose. Saltwater fish are usually toothier and larger and therefore require longer nosed pliers. 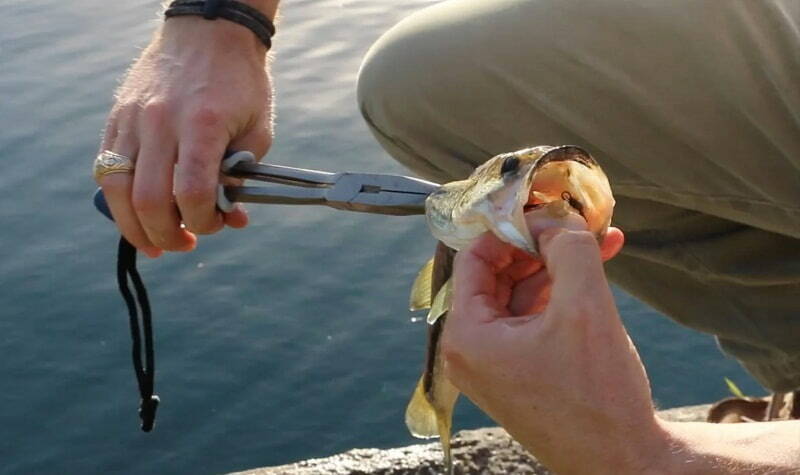 Look for stronger side cutters to ensure that you can cut hooks. Cheap pliers will always buckle in this kind of a task, look for heavier ones. If you use braided lines, then you need for dedicated line cutters. Your usual line cutters on essential pliers can cut monofilament and fluorocarbon but will not achieve anything when it comes to braided lines. All pliers will have a line cutter, but few will have a side cutter included. Go for a tool that has both and ensures that both cutters are strong enough to hold their own. The various tools that come with such pliers do vary by each model. With that in mind, you have to compare different options with one another to see what might work best for your fishing demands. This usually comes with a bonus feature and comes in handy whenever you need to replace or change a treble hook on your lure. You will fumble around forever installing split rings if you don’t have a split ring tool to ensure your choice of plier has it. You would be forgiven to think that price has nothing to do with the kind of pliers you get to choose. It is always attractive to go for the bargain, but it is commonly equipped that cheap is expensive. Airplane-grade aluminum and 420HC Stainless Steel don’t come cheap; neither do silicone grips with integrated bottle openers and lanyard holes let alone extra replaceable blades. If you want a tool that will give you excellent service while remaining durable, you want to go for the costlier stuff. On the other hand, you should always know that expensive doesn’t always mean quality, so you need the balance. When buying fishing pliers, go for known brands which have been in the market for some time. You are likely to get the best deal since they have a reputation to protect. Brands like Buck Knives are so sure of their products that they have placed a lifetime guarantee on their pliers. That would be a great place to start. Two kinds of cutters should be found on your fishing pliers. A line cutter is the main one that is sharp and goes through all sorts of fishing lines and reels. The side cutter is a thicker item on the pliers that is designed for hooks. It cuts through hooks quite well and assists you with removing it from all sorts of surfaces. An additional split ring tool may be added to the cutters. It uses a small latch that lets you open up rings. It works in just a few seconds to clear out any ring and keeps you from having to use your hands to make it open up and work properly. A great set of fishing pliers will help you to remove all sorts of items with ease. Great pliers will work by removing old wires, hooks, split rings and lines among other items. Such pliers must be capable of removing all these materials so it will be easier for you to get the most out of a fishing lodge. Look at how well the grip on a fishing plier set designed? A grooved grip gives you more control over the pliers so they will not slip out Such grooves should be spaced to where they will fit around your fingers quite well. Look at how the fishing pliers are made? Stainless steel is a popular material for pliers as it is strong and does not bend. 420HC stainless steel is especially great for how it does not rust or weaken. Aluminum can be used as it is strong and light in weight. Look at how well the aluminum body is shaped though as you don’t want a model that could bend or weaken quickly. Review the overall length of the pliers. Anything that is longer will work for saltwater fishing where you have thicker and tougher lines to work with a longer model can also handle larger hooks and especially get into some spots that might be rather deep. It helps to lock up your pliers when you are not using them. This keeps them from being exposed to outside materials. By using a lock, you are keeping the pliers secure while ensuring they do not accidentally latch onto something while in storage or while you are transporting them. In summary, the best fishing pliers for your use should be long enough and capable of cutting through many materials. With these points in mind, the Zitrades Fishing Pliers is the best choice. This appealing option has a strong layout that adds a fine look that is comfortable on your hands and has enough cutting spaces that make them easy to grip onto and use. The ability to remove hooks and rings with these pliers set is especially impressive for how it runs quickly and effortlessly to give you the power needed for keeping your pliers strong and ready for many uses. There are a lot of many qualities of fishing pliers to ensure you have fun while fishing effectively. You can always use the above qualities to choose the best fishing pliers for your fishing. A thoughtfully designed product will be very beneficial and is more likely to give you a better angling experience by reducing most of the problems that you would otherwise experience without a pair.